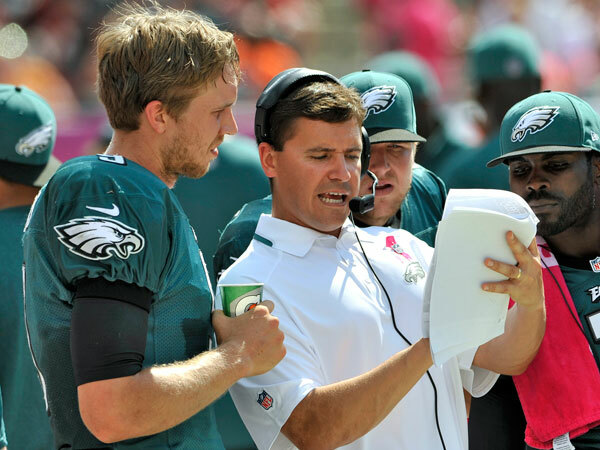 The Miami Dolphins have hired former Eagles quarterbacks coach Bill Lazor as their offensive coordinator. This move follows shortly after the perceived favorite for the job, Ben McAdoo, joined the Giants as their offensive coordinator. Lazor spent one year as the Eagles offensive coordinator. Under Lazor Philadelphia quarterback Nick Foles flourished. My assumption is Miami is hoping he'll help Tannehill do the same. It seems like a smart hire to me. My main concern with our hiring of a new offensive coordinator is how the change would slow down Tannehill, but the Eagles put in a new offense last year and Lazor was a part of that. Lazor was a bit of a surprise to me. I fully expected Miami to hire McAdoo fairly quickly, but that didn't end up happening. If I was placing bets at the Football Betting Center then I would have been fairly confident in picking McAdoo, but apparently the Giants had a different outcome in mind. I'm really excited to see what Lazor will do with Miami's running game. Philadelphia had a special running back in LeSean McCoy, and Lamar Miller isn't on his level, but hopefully he saw how to properly use a talented back and will do so with Miller. I was definitely disappointed when McAdoo went to the Giants, but hiring Lazor is a move that sits well with me. Now we'll just have to see who the Dolphins hire as general manager. Hopefully they can have that done quickly to get on to building this team for next season. Miami is almost there in terms of talent. Lazor is a step in the right direction. If a few plays had gone the other way in Miami the Dolphins could have still been playing in January. This team isn't far off. I'll stand by that.